Although there have been many who have tried to earn the nickname of “Hammer” in major league baseball, there has really only been one known as “The Hammer” to fans and teammates on the teams in which he played. His name is Hank Aaron and he was known as “Hammerin’ Hank” by those who loved him. He was a man with a long and productive career in the sport he loved and he would ended it with over 700 home runs. And these days, he now dedicates his time to his charitable foundation the Hank Aaron Chasing the Dream Foundation. 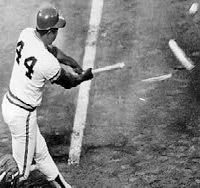 Not only was Hank Aaron an impressive baseball player, capable of explosive power at the plate and dazzling play in the field, but he also broke color barriers in the game. 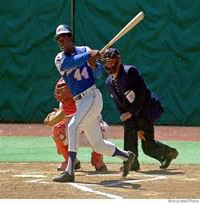 Hank Aaron made sure that the color barriers that Jackie Robinson helped start to knock down stayed down. All the while he continued to give outstanding play on the field, while behind the scenes his team had to deal with things like death threats and the press that covered his accomplishments had to do the same. When Aaron left baseball he wanted to give back to communities who had supported him and he really wanted to reach out to the youth of America. He knew that when he was younger it was the encouragement he got that gave him the strength to tackle the color barriers in front of him to have a successful career in baseball. In 1994 Aaron and his wife formed the Hank Aaron Chasing the Dream Foundation, or HACDF, with the goal of supporting ambitious youth. It was not an easy start, however, just like his time in the major leagues. During some of its early years, the charity struggled to raise funds. However, Aaron had become a smart businessman once he was outside of baseball, and he turned his efforts towards using the money he made with those businesses to support his charity. He began making key connections with other entrepreneurs around the country and learned from them and soon the money began pouring in. The foundation ended up making 755 monetary grants to deserving youths around the country. In case you were not aware, that is one donation for every home run Aaron hit during his major league career. These days Aaron also works with other sluggers from around the world to promote baseball for young people as a way of advancing in their lives. He has also teamed up with Major League Baseball to raise awareness, support and donations for his charity endeavors. Hank Aaron has always been a man dedicated to smashing down barriers. Whether those barriers were the color barriers in front of him when it came to baseball, or it is the barriers he faced while raising money to help young people around the world. He has proven to be capable of hammering down those barriers as easily as he could hammer out the home runs on the baseball field.